Optoma is a leading name in projectors for both the home and business. If you’re in the market for a high-quality 4K projector for your home theater, there are two models that will likely catch your eye: the UHD50 and the UHD60. 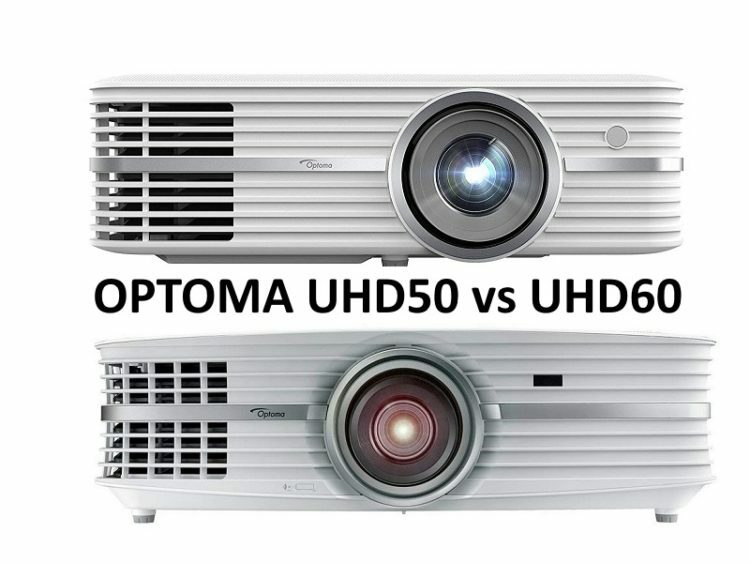 Comparing the Optoma UHD50 vs UHD60, you’ll find them very similar in terms of the overall operation. There are some key differences, however, which account for the price disparity between the two models. Are you looking at an Optoma projector for your home theater? Read on below for a full breakdown of the features, and to figure out which one is the ideal fit for you! The UHD50 is the more affordable way to get 4K UltraHD definition from the Optoma catalog. It’s still definitely what you would call a high-end projector, in terms of both the build and the price. The 4K resolution isn’t the only reason we love the picture on this model. It’s sharp, bright, and clear for all content types and formats, making it a great versatile choice for the home. The high-performance DLP chip that drives this projector is the key reason it’s able to deliver such a consistently good picture. Since it’s a one-chip system you don’t need to worry about the alignment, making it easier to set up than a lot of 4K projectors. This also decreases the lag time, especially nice for people who want to hook their projector up to a gaming system. The brightness of the lamp is fairly standard—it won’t be the sharpest picture in a well-lit room, but you don’t need to make the room completely dark, either. It also has an impressive contrast ratio and uses HDR10 technology for the display. The clarity and color accuracy of the picture is close to theater quality as a result. It’s also great that Optoma has made the UHD50 easy to set up and use. It has both zoom and vertical lens shift functions to perfect the placement of your image and it has a flexible throw ratio that makes it easier to get the screen size you want in any space. The menus are intuitive and easy to use, even for people who need to switch back and forth between content sources. Overall, we’d call this projector a great value that’s easy to integrate into any home theater set-up. The UHD60 is very similar in a lot of respects to the UHD50 above. It also gives you 4K UltraHD definition on a screen up to 140” from a high-performance UHD chipset. This might make you wonder what advantage you get for spending extra money on the UHD60. The differences between the two are subtle, but you will get a better picture quality with this projector than the one above. In terms of the set-up and operation, it’s just as easy to use as the UHD50 and arguably even more flexible. It gives you a zoom up to 1.6x, more than most projectors, and also has a 15% variable lens shift. The throw ratio also gives you a lot of options in terms of the placement. It’s not a portable projector, by any means, but the set-up process is so quick you could use it in multiple rooms of your home without much hassle. The biggest improvement you’ll get with the UHD60 is to the lamp. It’s about 20% brighter than the lamp on UHD50, and it has a longer lamp life, too. It’ll last for up to 10,000 in standard use conditions, or as long as 15,000 if you use the projector’s eco-friendly, energy efficient mode. This means less maintenance and expense over the life of the projector, an added bonus from an already impressive projector. If you’re looking for the absolute best picture quality, you’ll want to buy the Optoma UHD60. It has a brighter lamp and a higher contrast ratio than the UHD50, and it uses a more sophisticated interior process that improves both the quality and the speed of the image response. The question for a lot of people is whether the UHD60 is worth the extra expense. In our estimation, the UHD50 is a better value. The UHD60 looks better, but that doesn’t mean the UHD50 looks bad—its picture quality is better than any other model you can get for the price. If the absolute sharpest image isn’t the main concern for you, you can save yourself quite a bit going with the lower model. Either way, you go, these are both solid projectors that will serve you well. Optoma has earned its reputation for quality with the years of high-end projectors under their belt. We hope you’ll get countless hours of enjoyment out of whichever one you buy! Next articleWhat is Contrast Ratio in a Projector?